Big Impact: Link Up 2015 serves more students than ever before! Link Up: Seattle Symphony invites students in grades 3–5 to join the orchestra in this highly participatory program. 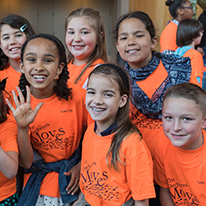 Students learn to sing and play an instrument in the classroom using the Link Up curriculum, then perform with the Seattle Symphony from their seats during the culminating concert at Benaroya Hall. 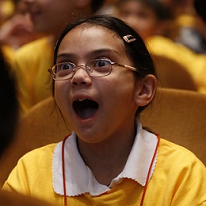 From classroom to concert hall: Link Up students perform with the orchestra! In preparation for the concert at Benaroya Hall, over 2,000 students participated in a Link Up residency program which invites Seattle Symphony Teaching Artists to their classrooms every week for 5 or 10 weeks. These visits, in collaboration with the classroom teachers, deepen the students' musical journey through the Link Up program. Students sang and played recorder and violin along with the orchestra from their seats in the 2014–2015 program, The Orchestra Rocks. "We offer Link Up at minimal to no cost. Non-discounted costs range from $2 to $6 per student, depending on program level. Each student is given their own Link Up activity book and admission to the Link Up concerts. 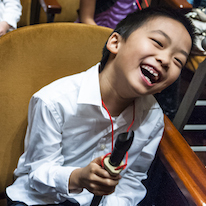 Schools participating in the residency program have a Seattle Symphony Teaching Artist visit their classroom for 5 or 10 weeks, and each student receives their own Link Up activity book, a soprano recorder and admission to the final Link Up concert. Priority is reserved for those schools with the greatest need. Schools with 60% or more free or reduced lunch rates receive discounted Link Up fees or participate for free, depending on need. We will not turn away anyone." "Link Up lets students ‘show what I know.’ They own the performance as much as the musicians on stage." "We know that students are more successful when they are active learners and are able to create meaning through their experience in playing and creating. The Link Up experience will be one that many of our students will never forget." To learn more about Link Up: Seattle Symphony or to enroll your class in the 2015–2016 program, click here. Your gift today can help make Link Up accessible to even more students. Link Up: Seattle Symphony is growing fast!